I thought to contrast with last month’s dark Caravaggio, for November I would pick something light and fluffy – two words synonymous with Rococo. Contrary to what I feel great art should be, I can’t help but love Rococo. Obsessed with beauty, sensuality and all things frilly, the style was a reactionary evolution of the Baroque in Europe. In France, it materialised through artists such as Jean-Antoine Watteau, Jean-Honoré Fragonard and François Boucher (1703-1770) – here depicting Rococo personality the Marquise de Pompadour at her Toilette (1750). 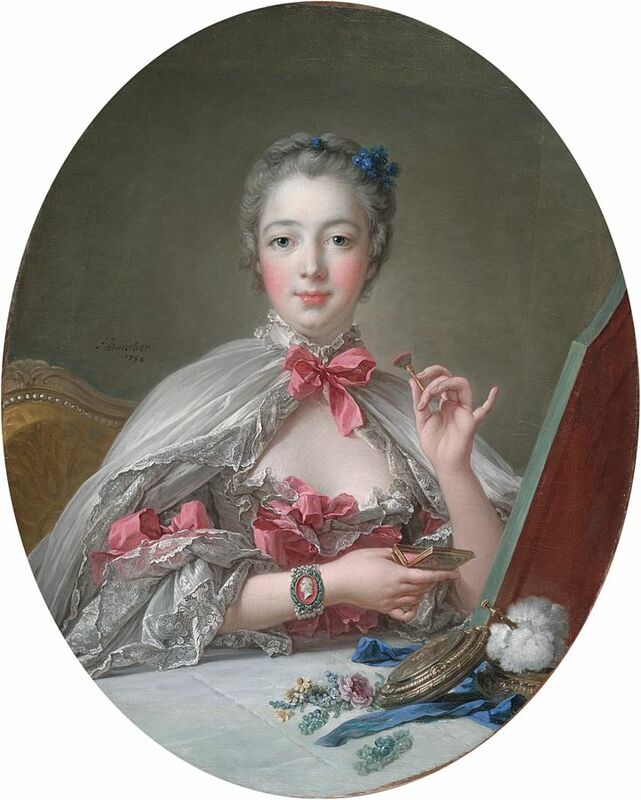 Depicted in contemporary style the Marquise de Pompadour (born Jeanne-Antoinette Poisson in 1721) is porcelain-skinned with powdered hair, pouty rosebud lips and rouged cheeks. She exudes youth (she is depicted here in her 30s) and beauty, fresh and doll-like. We have caught her at her toilette (French for the process of grooming and dressing), an important part of the day that would take place in a lady’s boudoir, accompanied by her confidants. Not yet fully dressed, she wears a beautiful white lace dress with pink ribbons, covered by a protective cloak or peignoir. Frozen in her pose, we have caught her as she raises her left hand gracefully, about to apply more powder to her already deeply flushed cheeks, her plump little finger extended. Her right hand holds a compact, and on her wrist is a cameo with King Louis XV’s profile – a tell-tale sign of her position at court. Sitting before a mirror presumably in her boudoir, we see what she sees in her reflection. There are a number of objects on her vanity table; a posy of flowers, some of which have been put in her hair, a feathery powder puff and a blue ribbon, all of which can be read as symbols.